Among orientalists, Sergei Grigor'evich Klyashtornyj is known as an outstanding and highly esteemed scholar. The prestige he enjoys is based on his charisma and his intelligence, as well as on several decades of tenacious work. He was born on 4 February 1928 in Gomel (south-eastern Belarus), where both his parents worked as physicians. In 1930 his family moved to Leningrad, the city where he has lived permanently up until the present day. In 1945 he became a student of the Faculty of Oriental Studies at the Leningrad State University, from which he graduated in 1950. His student age coincided with the difficult period immediately following the exhausting World War II, during which the great city on the Neva heroically held out against a long siege that caused terrible loss of human lives and immense material destruction. Nevertheless, the city's level of university education and of academic life stayed high, so Sergei Klyashtornyj could fully benefit from that background. Worth mentioning is the fact that, after the October Revolution, Leningrad managed, more than other centres of the Soviet Union, to preserve the high standard of research established in pre-Revolution times, and also to remain open to scientific achievements of the West. As early as his student years Sergei Klyashtornyj was attracted by the history and culture of Turkic populations that inhabited vast areas of Eurasia during the latter half of the first millennium and the first centuries of the second. Throughout more than a half-century (1947-2001), he strove to increase his own stock of information. First as a student, then as a researcher and as head of various investigation teams, he participated in numerous expeditions to Central Asia (Kazakhstan, Kyrgyzstan, Uzbekistan, Turkmenistan), to southern Siberia, Tuva and Mongolia, those expeditions enabling him to collect abundant documentary materials. The doctoral thesis that he defended at the University of Moscow, in 1964, was entitled Old Turkic Runic Inscriptions as a Source for the History of Central Asia. The great scholar was primarily preoccupied with the mediaeval past of the Turkic ethnic mosaic of Central Asia and of the adjacent areas, which he approached by resorting to narrative, linguistic and epigraphic sources, without overlooking archaeological finds and ethnographic facts. He paid special attention to Turkic Runic inscriptions, which had been found all over Central Asia and western Siberia, and which contained most valuable information regarding ethnic, political and social relationships specific to those parts of the world. Although the Old Turkic script had been decoded as early as the end of the nineteenth century, the precise meaning of certain terms remained a matter of controversy and a reason for further investigation. Also, besides those epigraphic finds, new inscriptions, of a different kind, have been discovered during the last decades, and those inscriptions raise difficult problems of decoding and interpretation. Sergei Klyashtornyj is one of the specialists who have striven to turn to account information contained by Old Turkic inscriptions. His highly valued achievements account for his ascent to the position of head of the Department of Turkology and Mongolian Studies at the Institute of Oriental Studies of the Russian Academy of Sciences, in 1963. In that quality he combined research and teaching, as he was preoccupied with the training of young people in the field of Turkology. In that respect, at the Faculty of Oriental Studies of the Leningrad / Sankt-Petersburg State University he held several courses, of which worth mentioning are the following: Old Turkic Runic Inscriptions as Historical Source, History and Culture of Old Turkic States, History of Central Asia in the Ancient and Medieval Times, Ancient and Medieval Nomads in the Eurasian Steppes, Civil Order and Political Institutions among the Peoples of Central Asia. Professor Klyashtornyj is the author of over 300 academic works -volumes, studies, articles, notes -, most of which are on the history and culture of Turkic populations, on interpretation of Old Turkic texts, and on the ancient and mediaeval history of Central Asia. Here are some of his most remarkable monographic writings: Древнетюркские рунические памятники как источник по истории Средней Азии (Moscow, 1964), Восточный Туркестан глазами русских путешественников (вторая половина XIX в.) (in collab. with A. A. Kolesnikov) (Alma-Ata, 1988), Восточный Туркестан глазами европейских путешественников (in collab. with A. A. Kolesnikov and М. S. Baskhanov) (Alma-Ata, 1991), Казахстан. Летопись трех тысячелетий (in collab. with Т. I. Sultanov) (Alma-Ata, 1992), Степные империи Евразии (in collab. with D. G. Savinov) (Sankt-Petersburg, 1994) (Second edition with substantial additions, Sankt-Petersburg, 2005), Государства и народы евразийских степей. Древность и средневековье (in collab. with Т. I. Sultanov) (Sankt-Petersburg. 2000) (Second edition with addenda et corrigenda, Sankt-Petersburg, 2004), История Центральной Азии и памятники рунического письма (Sankt-Petersburg, 2003), Памятники древнетюркской письменности и этнокультурная история Центральной Азии (Sankt-Petersburg, 2006), Staaten und Volker in den Steppen Eurasiens. Altertum und Mittelalter (in collab. with Т. I. Sultanov), ed. R. Schletzer (Berlin, 2006), Die Geschichte Zentralasiens und die Denkmaler in Runenschrift, ed. by R. Schletzer (Berlin, 2007). Besides those single-author works, he also contributed to collective volumes, such as: История Казахской ССР, II (Alma-Ata, 1979), История древнего мира, III, Упадок древних обществ., 3th ed. (Moscow, 1989), Краткая история уйгуров (Alma-Ata, 1991), Восточный Туркестан в древности и раннем средневековье. Этнос, языки, религия (Moscow, 1992), История Востока, И, Восток в средние века (Moscow, 1995), Источниковедение Кыргызстана (с древности до XIX в.) (Bishkek, 1996), History of the Civilization of Central Asia, III, The Crossroads of Civilizations: A.D. 250 to 750, ed. by B. 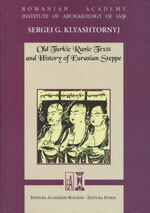 A. Litvinsky (Paris, 1996), History of the Turkic Peoples in the Pre-Islamic Period, ed. by H. R. Roemer (Philologiae et Historiae Turcicae Fundamenta, I) (Berlin, 2000), История Казахстана и Центральной Азии (Alma-Ata, 2000), История татар с древнейших времен, I, Народы степной Евразии в древности, ed. by S. G. Klyashtornyj (Kazan, 2002). The appreciation the professor of the University of Sankt-Petersburg has enjoyed at home and abroad is manifest in the fact that he has been invited to numerous international congresses and academic gatherings; he has also been invited to send his contributions to onthological volumes and to journals issued by prestigious academic institutions of Europe and America. Last but not least, he became a member of prestigious academic societies in Europe and in America; among other things, he became honorary member of the National Academy of Sciences of Kyrgyzstan, of the Csoma de Kurds Society of Hungarian Orientalists, and of the Central Eurasian Studies Society (USA), as well as a member of the Ataturk Kiiltur, Dil ve Tarih Yiiksek Kurumu (Turkey) and ofSocietas Uralo-Altaica (Germany). The editors of the present volume are happy to provide a selection of Sergei Klyashtornyj's most representative studies for specialists and for mere readers interested in the history of Eurasian populations. Those studies have been included in journals and treatises published mainly outside Russia. Unfortunately, we have not been able to add here other valuable articles by him. For some of these studies, Professor Klyashtornyj collaborated with outstanding specialists, such as: V. G. Guzev, V. A. Livshic and D. G. Savinov. The makers of this volume wish to express their gratitude to Professor Klyashtornyj for his kind assistance, as well as for the priceless help he provided in copyright arrangements with publishing houses that first published his studies. For a number of linguistic adjustments of the texts in English and French, we benefited from the help of Adrian Poruciuc and Michaela Spinei, respectively. For the typing and scanning work (which implied serious difficulties especially as regards Oriental scripts) we are most grateful to Miss Anca Ancuta of the Iasi Institute of Archaeology. 13—14 сентября 2018 г. в Санкт-Петербурге состоится Первый Международный Конгресс Евразийской Ассоциации иранистов. Он пройдет на базе ИВР РАН и Государственного Эрмитажа и будет приурочен к празднованию 200-летия российского ирановедения и востоковедения.